The internet is lighting up with conspiracy theories that a body double was used to stand in for Hillary Clinton as she emerged from her daughter' apartment Sunday after collapsing at a 9/11 memorial ceremony. “Nose looks very different,” one person wrote on Twitter. “Hillary's index finger is longer than her ring finger. This isn’t Hillary,” wrote another. An additional person wrote: “The person outside Chelsea’s apartment has skinny legs and torso! You decide!” Another conspiracy theorist noted the absence of any obvious Secret Service agents nearby when the Democratic presidential candidate walked out of Chelsea’s Manhattan apartment building. 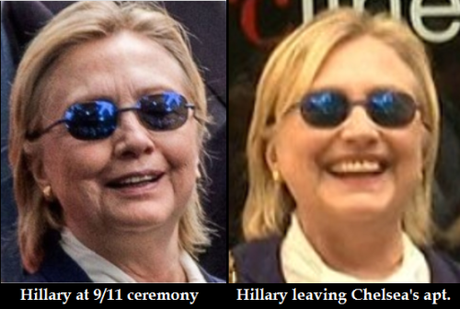 Did Hillary Clinton Use a Body Double After Falling Ill at 9/11 Memorial Appearance? The internet is lighting up with conspiracy theories that a body double was used to stand in for Hillary Clinton as she emerged from her daughter' apartment Sunday after collapsing at a 9/11 memorial ceremony. “Nose looks very different,” one person wrote on Twitter. “Hillary's index finger is longer than her ring finger. This isn’t Hillary,” wrote another. Another conspiracy theorist noted the absence of any obvious Secret Service agents nearby when the Democratic presidential candidate walked out of Chelsea’s Manhattan apartment building. Some citizen sleuths claimed the woman emerging from Chelsea’s apartment was actually someone named Teresa Barnwell — who is the spitting image of the presidential candidate. But Barnwell has an ironclad alibi to prove that she was not in New York. She was impersonating Clinton 3,000 miles away in Los Angeles over the weekend. She appeared live on Spike TV's Lip Sync Battle along with lookalikes of Bill Clinton, President Obama and First Lady Michelle Obama. She told Inside Edition she sent out the message on social media to "just kind of mess with people because of this rumor that had started that some kind of body double had come out of the apartment instead of the real Hillary. I mean, come on." Barnwell also took to Twitter to tell conspiracy theorists to relax. She told Inside Edition that she is truly not Clinton’s body double. “I don't do that kind of work and I don't even know that it exists,” she said. So if it isnt Barnwell than who is the mysterious woman outside Chelsea Clinton's apartment? Could Hillary still be alive inside chelsea Clinton's NY apartment?